The first step is to find out WHERE the sales are happening. A great source of information is your city's list of garage sale permits. They are usually displayed somewhere at city hall or on the community bulletin board. Figuring out where the garage sales are by looking at the permits is a great place to start. Other ideas for finding the sales-- checking your local newspaper for announcements and/or driving around looking for signs you can compile a list of potential shopping spots. You probably won't be able to hit every house on the list, so prioritize those in nice neighborhoods and pull up Google maps to find sales near each other. Zigzagging all over town is no fun. Craigslist.com is another great source with daily/weekly postings of local yard sales and garage sales. Don't roll out of bed at 10:00am on a Sunday and hit the pavement thinking you're going to find great deals. You want to be the first person there Saturday morning. Do, however, mind the start time of the sale. If the sign or ad says it starts at 8:00 am, don't show up at 7:00 am while they are just putting out the tables. This will only make them feel rushed and annoyed and it might hinder any haggling opportunities. Are you looking for specific items? 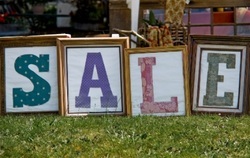 Make a beeline for the sale's host when you arrive and let them know what you're after. You never know what treasures are lurking just inside that garage door. By politely inquiring about what you're hunting for, you can save yourself valuable time. Plus, you are triggering the host's memory… they may not have all the boxes unpacked, they may have been on the fence about selling something, or even forgotten about the item all together. While it's only logical that the yard sale host should have a plethora of ones, fives, and tens on hand, often times they don't. With all the cleaning, organizing, and advertising that goes into having a yard sale many hosts will forget to stop by the bank and pick up sufficient change… leaving you up a creek with a twenty-dollar bill. So stop by the bank the night before, set your yard sale budget, and get it in ones and fives. When it comes to purchasing electronics or anything mechanical don't buy it unless you can try it, even if the host assures you that it works. Things decay and stop working over time when not being used. Maybe last time they fired up that leaf blower 5 years ago, it powerfully blew the leaves away, but that doesn't mean it's going to work now. So ask for an extension cord or bring a pocket full of batteries and be sure you try before you buy.